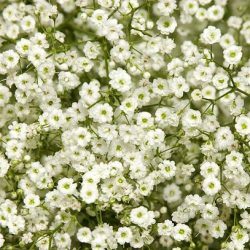 Many flowers are delicate looking but none compares to the delicate nature of Baby’s Breath Flowers. As the name suggest, the blooms are made up of tiny white flowers, not larger than a baby’s finger tip. 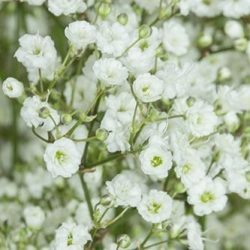 Also known by floral designers as Gyp or Gypsophila. The tiny white flower delicately bloom at the tip of a cluster of branches. 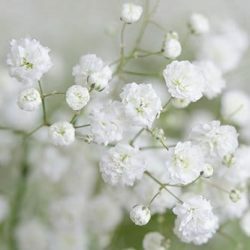 Despite the flower bloom’s tiny size, the white Baby Breath offer a sense of purity and soft tone gentle to the eyes but energizing to the inner being. 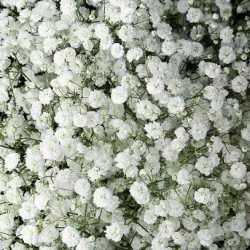 The delicate allure of Baby’s Breath Flower is ideal for decorating and beautifying a weddings or special occasion. One bunch of Baby’s Breath will make a simple and beautiful Baby’s Breath Bouquet or Baby’s Breath Centerpiece. Ideal for barn or rustic style event. 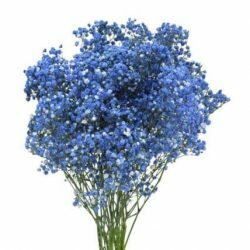 Buy wholesale Baby's Breath Flowers for special occasion or wedding decoration.